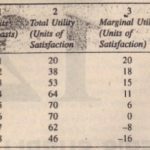 From schedule given above, we can see that when we move from one combination of the two commodities to another, we arc in fact substituting some units of one commodity for some units of another. We can also work out the rate at which this substitution lakes place. The Marginal Rate of Substitution shows how much of one commodity is substituted for how much us another or at what rate a consumer is willing 10 substitute one jocundity for another in his consummation pattern. The concept of marginal rate of substitution is a tool of indifference curve technique amid parallel 10 the concept of marginal utility in the Marshall analysis of demand. Taking our previous example of substitution tween apples and mangoes. we notice that when our consumer has 15 apples and one mango. he will he prepared to forgo 4 apples for I mallow and yet remain at the same level of vacationist. Or. in other words. we can say, in case he has the second combination. then he will be prepared 10 accept-t apples [or the loss of once mango the marginal rate of substitution of mangoes for apples. 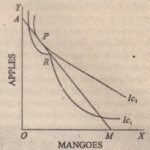 The marginal rate of substitution may thus be defined as amount of apples that is sacrificed for obtaining one mango or it may also defined as the amount of apples that may be given to the consumer for the loss of one mango so that he may remain at same level of satisfaction.